In the center and pedestrian area of ​​Granada. You can walk to all attractions. Private parking (10 € / day), ask availability. It has 3 bedrooms. Master bedroom with bed 150 cm and the other two bedrooms with two beds of 90 cm each. Lounge and master bedroom spacious, bright and exterior. Extensible sofa seats and chaise longue. It is located in the central and pedestrian area of ​​Granada. Possibility to walk everywhere without any means of transport. 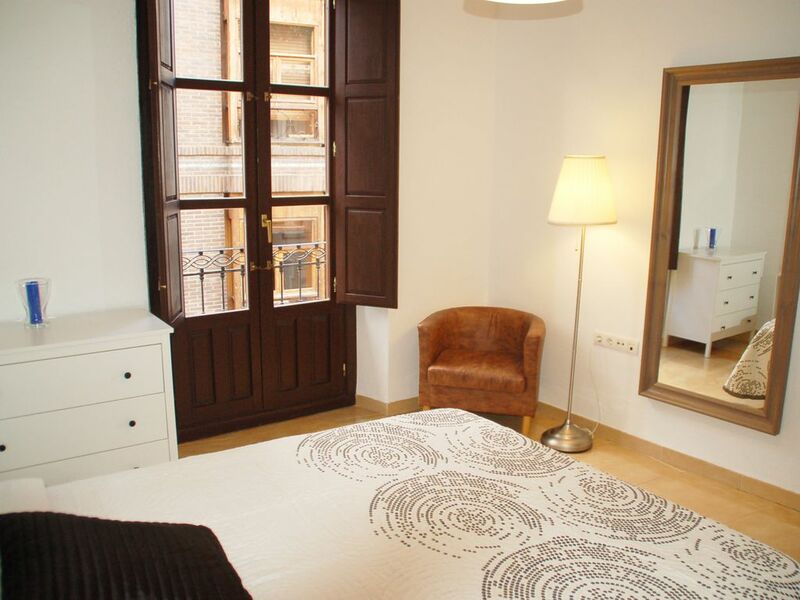 The apartment belongs to a listed reforming urban interest, in a charming area of ​​Granada building. In the center, ideal for walking visit the most emblematic of Granada, and perfect for shopping and tapas places. It has three bedrooms. Master bedroom with bed 150 cm and the other two bedrooms with two beds of 90 cm each. large living room with extensible sofa and chaise seats, two tables. Lounge and master bedroom spacious, bright and exterior. Kitchen: refrigerator, oven, toaster, microwave, blender, sandwich maker and utensils for six people. Bathroom with towels, gel, shampoo and hair dryer. Washer and dryer available for long stays. On arrival you are greeted in the apartment. Flexibility for check in, we try to adapt to the arrival of guests where possible. Check first if check-in is done after hours. very central, quiet pedestrian area. Next to-monumental areas of cultural interest. Surrounded by shops, cafés, typical restaurants and tapas bars. Other services nearby banks, tourist office, theater, Arab baths, postal service. The apartment is located in the most important shopping area for shopping. Less than 5 minutes' walk from the Cathedral, the Royal Chapel, the Madrasa, the Alcaicería, Corral del Carbon, Plaza Bib-Rambla, Plaza Nueva, etc. No need to use any kind of transportation to visit the sights from the apartment, but has taxi and bus nearby. Also available nearby tourist train stop. public car park 50m. the apartment. We would like to feel at home and take care of her as such. respect are requested to schedule rest of the neighbors. Smoking is not permitted inside the apartment, but you can do so on the balconies. The security deposit is payable on arrival at the apartment to cover any damages that may occur. This deposit will be returned upon departure. The time of entry will be from 16h to 22h. Please communicate arrival time for treatment. Check Out will be held before 13h. although it can be flexible, depending on availability on the calendar. Great property right in the middle of history. Property managers wonderful. Great 3 bedroom apartment. Stylish and comfortable except for a few issues. Only one bathroom which we were aware of but only enough hot water for two showers. Couch is not very comfortable but worked fine. Master bedroom is on a very noisy street with rowdy bar customers until 4 am. Bring your earplugs which worked for us. We stayed in this apartment with our 4 young children for 5 nights. The location is perfect, so central for discovering the city and just a 40 minute drive to Sierra Nevada with parking just around the corner. The apartment itself was very clean, well equipped with all you need from washing machine, dryer, iron, shampoo, hairdryer etc. Belén was a perfect host, she always responded quickly to any questions and was very welcoming on arrival. No hesitation to highly recommend this apartment. Thank you for your comments. Vera and her family were great guests. They have left the apartment in perfect condition. They would always be welcome again in our home. Thanks for your visit, it has been a pleasure to meet you.